Sally saw this one. I'm guessing they don't literally hold things for you either. Sorry. The first paragraph talks about holding unsold merchandise, which is inane. The second paragraph starts to make sense, describing the non-holding policy for purchased items. 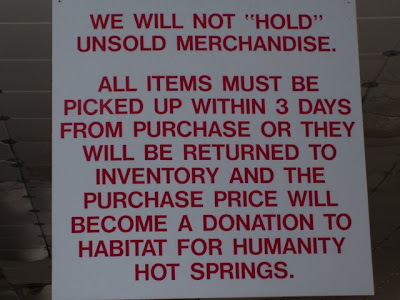 If this is from a store, don't they already "hold" unsold merchandise? I mean, it's unsold, until someone pays for it.